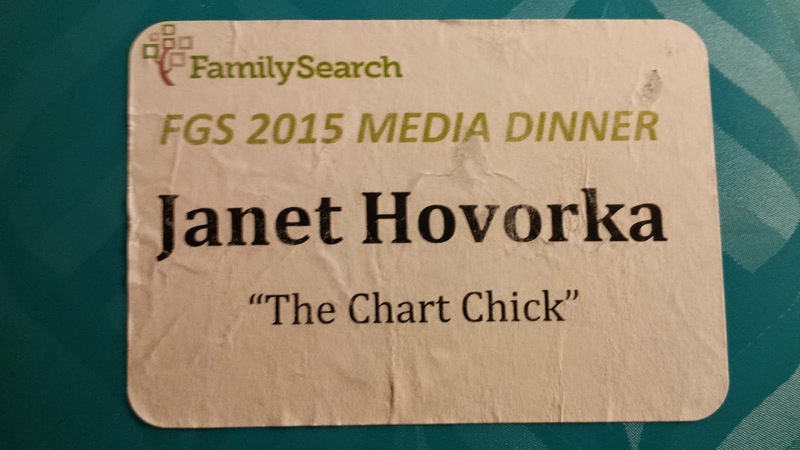 I got to go to the blogger dinner last night to catch up on everything that FamilySearch is doing. It was great seeing everyone and getting a chance to listen to the FamilySearch presenters and have some time to talk to them. Lots of exciting new things going on. David Rencher started out by talking about how they are ramping up the camera teams. They are hoping to have 500 teams around the world doing digitization by next year. He also said there are 10 images created for every one image that is indexed. So we are in great need of more indexing. That's still a great problem to have though. He also said they are getting better at tracking what is going on in the Family Tree. They are tracking people with multiple parents (especially many sets of parents--obviously a problem) and that number is starting to go down. We are making progress on cleaning up the data that was brought in from the myriad of FamilySearch databases when Family Tree was created. And we are getting better at putting in good data. So that is good news too. Then Dan Call spoke about the upcoming RootsTech conference. I'm really excited about the two lectures they accepted of mine, "Family History Adhesive: The Science of Why History Binds Families and the Simple Tech of How to Do It" and "6 Steps to Choreograph Your Research Across the Internet" (More to come on that in a bit) The theme is "Who Inspires You?" I don't remember seeing that theme in the call for papers. I wish I had known about it because I might have submitted entirely different stuff. I'm always talking about being inspired by your family history (for example here and here--besides my books). I think I have alot to say about that. One statistic that caught my eye was that in 2013 there were 5250 paying attendees of RootsTech. And in 2014 there were 5500. I thought that was interesting that the profitable part of the conference only increased by 250 people. Yet the exhibitors jumped from 140 to 170. I think the size of the non-paying attendees (Family Discovery Day, etc.) has made this look like a profitable industry and encouraged new companies to enter the waters, but in reality, the market really hasn't grown that much. It is disconcerting to me that the expo hall has doubled each year, and is going to double in size next year, and yet the financially vested attendees has not. This, combined with the fact that a select few RootsTech talks have been broadcast far and wide and spawned a multitude of smaller family history fairs--without vendors--has the potential to affect the industry adversely. Next, Bryce Roper talked about the FamilySearch Mobile App that is now available on iOS and Android. It is looking really good. It can help you discover something new, add stories and links to the database, quickly add photos of sources with your device's camera, and --coolest part-- create and upload a recording. Bryce said the recordings can be up to 15 meg (about 30 minutes). Such a great tool for people to do interviews with. Soon you'll be able to edit vital statistics and add people to the tree. I'm excited to see this development as I think it will attract a whole new demographic. We had seen FamilySearch affiliates try to create a commercial app without success--again disconcerting--but I'm glad the job is getting done. I wish a commercial app had been a viable option because we need a stronger genealogy industry. The Memories app is also helping to capture stories and pictures etc but according to Bryce is only available in iOS so far and is not connecting those things to the tree yet. So more to watch for there. This is big for youth--of course one of my passions. I think apps for mobile devices is a game changer for anyone under 30. It is going to be alot easier to work on this with my kids now. We're heading out this morning to get set up for the conference. Mark Gowan and Robert Kehrer also had some really interesting things to say about searching. I'll cover that in FamilySearch Blogger dinner part II shortly. In the meantime, what do you think about these issues? I am interested in your thoughts about the low or no growth in the number of attendees in relationship to the distance viewers and the size of exhibit hall. I would guess it might depend on advertising, what RootsTech has to offer (will combining with FGS be a good thing and draw more in?) and who makes up the exhibitors - what percentage are selling something vs educational/informational (are societies looking to get their names out or are they selling their memberships?). I know in past I felt some of the talks were "done before" or were not much beyond beginner stage. Were they clearer in the past year and/or more advanced. Is RootsTech focusing on tech enough? Also I thought the young people's day was a bit of a misnomer - it was young people's day for LDS (nothing wrong with that) but it is not the same thing. If we want youth involved it might be a good idea to invite all youth or at least make clear what they are doing. If RootsTech is to be the big thing in genealogy it needs to think big as well (some ideas from WDYTYA Live would be a good thing). What do others think? I think 2015 will be a big year for RootsTech/FGS depending on how it plays out. I agree--this is going to be interesting to see how it all plays out. I didn't say the RootsTech numbers were down--according to FamilySearch the numbers were way up, but not the PAYING attendees. As a vendor I think that's a big distinction. I know the number of local attendees is a major portion of that. I think FamilySearch's agenda is clear--they want to attract LDS people to family history which is a largely beginner market. So I think RootsTech will always have a beginner focus. And as far as the youth day is concerned, no matter where you are you are really only going to attract local youth. Though I wish it were different, very few youth/families will travel to a genealogy conference--especially in February (school) so I think especially the youth portion of RootsTech will always be mainly LDS. But in the end--attracting a large local/LDS population is a good thing for all of us. FamilySearch is generously spending their non-profit money to take the risk and do new things to create a fabulous conference. As long as they feel that is money well spent they will continue to provide this wonderful opportunity for all of us. Janet, James Tanner Genealogy' Star Blog http://genealogysstar.blogspot.com/2014/08/comments-from-vendors-future-of.html article Comments from the Venders The Future of Genealogy Conferences has a similar view. He feels that online videos, webconferences, webinars, podcasts and such are making it easier to skip the onsite conference. His concern is that the youth are more familiar with these outlets and will be difficult to bring into the conferences. Vendors he has talked to are finding it difficult to break even or make money at all but the largest venues. Onsite conferences provide one big difference from everything else that is online and that is networking. Kids love to get together. For the LDS youth, EFY, girls camp, and everything social are big things. I think we can continue to have successful conferences for attendees and vendors if we build on the social aspects, the networking, that is so big in the genealogy community.